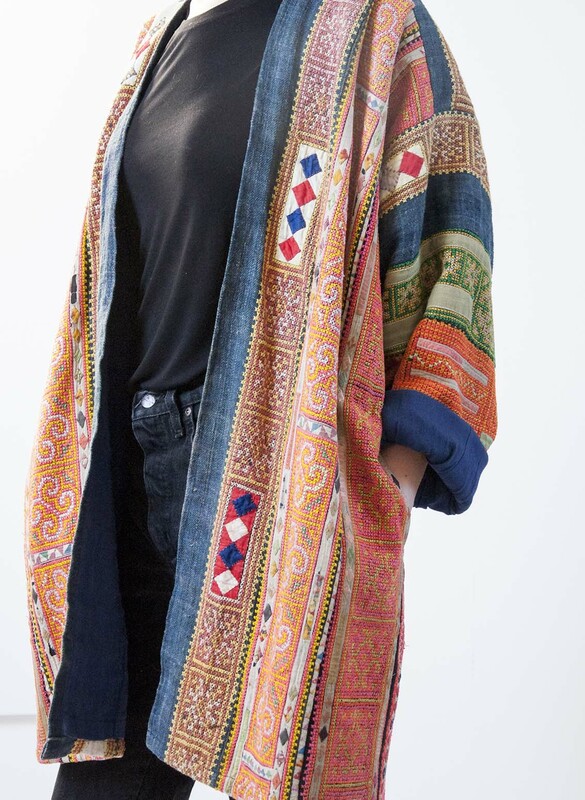 This stunning jacket is so detailed, special and colourful! Wear it with pride, or use it as an art object in your bedroom. This jacket is handmade from different rows of hand-embroided tapes. It’s lovingly patched and finished with indigo blue handwoven tapes. Lined with a bright blue cotton lining. The colours are so bright and intense, the patterns are beautiful and graphic, the hours of hand tailored work and the love that’s put in this item is indescribably. The origin of this jacket is in China with the Hmong people. Hmong is an ethnic group from the mountainous regions of China, Vietnam, Laos, Myanmar and Thailand. Every square is handmade by a Hmong hilltribe woman living in the remote hills of northern Laos using the reverse applique quilting method. The designs are traditional symbols for love, longevity, and life. Delicate accent embroidery adorns each square. Hmong means Free people. truly poetic. please do not wash this item. colours may bleed. air this item when needed.